While achieving a buoyant economic climate is a feat in itself, the real challenge lies in staying afloat. To sustain the economic optimism that Africa is now enjoying, it is imperative that governments, particularly in sub-Saharan Africa, address the critical issue of chronic power shortage, which hampers the development of various industries in the region. Africa has remained resilient in the face of the economic headwind of the previous years. This was the good news delivered by the African Development Bank (AfDB), which recently presented the African Economic Outlook 2014 in its annual meeting in Kigali, Rwanda. Africa’s economic growth, the continent-wide document suggested, was expected to reach 4,8% in 2014 and 5,7% in 2015, on its way to hitting the same numbers as it had before the 2009 economic downturn. The economic expansion, the report indicated, would be driven by domestic demand, infrastructure and a heightened continental trade in manufactured goods. Moreover, the report revealed that direct and portfolio foreign investments were projected to reach US$80-billion in 2014, and financial flows towards the continent were predicted to surpass $200-billion – four times its year 2000 level. The above-mentioned growth projections bode well for the entire continent, and AfDB suggested that in order to sustain the momentum and achieve economic sustainability and a development breakthrough, Africa would need to participate more actively in the global production of goods and services. In this way, added AfDB, the continent could boost its economic diversification, domestic resource mobilisation and investments in critical infrastructure. Is there enough power, though? Though the International Monetary Fund (IMF) concurred with AfDB, it sounded a caveat when it said that the observed power supply deficiency in the continent may rein in economic growth. It has been documented that some 25 countries in sub-Saharan Africa were facing an energy crisis, evidenced by rolling blackouts, and that some 30 countries in region had suffered acute energy crises in recent years. While the Key World Energy Statistics by the International Energy Agency reported that electricity generation in Africa rose from 1,8% in 1973 to 3,1% in 2011, the continent still remained to have the smallest share globally, despite being the second most populous continent. Nigeria, for instance, a country that has three times the population of the South Africa, only has one-tenth of the power generation capacity of the latter, and enterprises are already complaining about regular power interruptions. In Tanzania, a month-long blackout was experienced in Zanzibar when the underwater cable lines supplying power to the archipelago failed, following a surge in demand. As a result, residents were paying $10 daily to run diesel powered domestic generators, while businesses requiring refrigeration or heating had to suspend operations until the power was restored. In Kenya, it has been observed that only 25% of the population had access to electricity, and that only 5% of the country’s rural areas had access to the grid. The occasional recession of the water level in some of Angola’s rivers affects power production, disturbing other services, like water distribution. Luanda’s water supply firm, EPAL, cited that various areas in Luanda experienced water supply shortage, owing to challenges related to power distribution. Touted to be Africa’s biggest copper producer, the Democratic Republic of Congo (DRC) advised mining companies in the country to suspend any project expansion which would require more power, due to a power shortage that, the government said, would take years to resolve. While the country would reportedly institute an electricity-rationing program, mining companies were encouraged to postpone signing new contracts, in an effort to slowdown the growth of electricity demand in the country. Even the region’s largest economy, South Africa, was not exempt from power-related woes. In fact, in a recent communiqué, Eskom, supplier of 95% of the country’s electricity, warned residents of a rolling blackout due to load-shedding, which it said, was to protect the electricity grid from total failure. Eskom said it had begun scaling down maintenance to prepare for winter, but in the face of a rising demand, particularly during peak hours, it appealed to the public to reduce power consumption by at least 10%. If the power demand does not decline, then, the company said, load shedding would be the last resort to avoid a total power shutdown. With Africa’s population expected to double to approximately 1.9 billion people by 2050, the World Bank said that a much higher investment would be needed to at least double Africa’s current levels of energy access by 2030. In fact, it is estimated that the sub-Saharan region would require more than $300-billion in investments to achieve total electrification by 2030. As a response to this pressing need, countries in the region are mapping out strategies to supply more energy through alternative solutions. In the DRC, for instance, the Grand Inga hydroelectric project, expected to boost the country’s power supply by 44 000 MW, is said to be gaining traction, while in Zimbabwe upgrades to the Kariba South hydropower and the Hwange thermal coal plants, forecast to add about 300 MW and 600 MW, respectively, are reportedly in the pipeline. South Africa is also reported to be cooking up the building of two new coal-fired power stations at Kusile and Medupi, expected to individually add approximately 4 800 MW of capacity. The afore-mentioned initiatives are a testament to the tremendous attention that these countries are paying to their respective power generation challenges. Governments and private entities alike have been putting years’ worth of research and investigation, and billions worth of investment, to draw up the myriad adverse economic and social effects of electricity supply deficiency. A crucial element in the equation, however, is time, and in a world governed by more stringent business practices, faster turnarounds and heightened interdependency, the essence of time transcends chronos. Today, time may mean the difference between profit and loss, between political unrest and stability, and between economic growth and uncertainty. 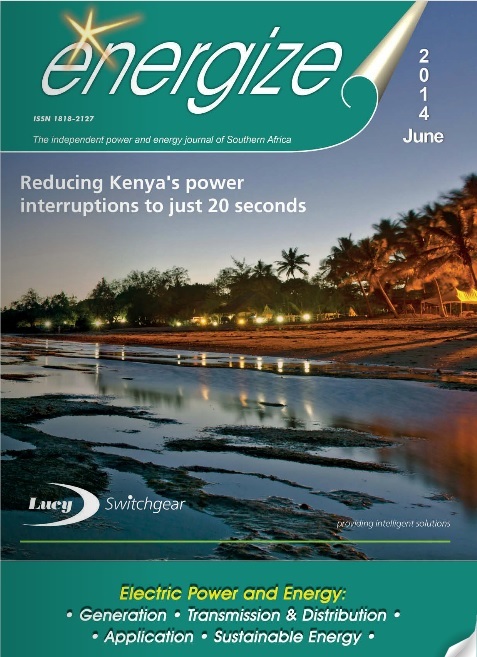 Southern Africa was observed to have absorbed the blow of the power crisis in recent years. Blackouts brought cities to a standstill and spelt terminal financial losses to small- and medium-size companies. One of the region’s flagship industries, mining, was also unfavorably affected, prompting mining companies to halt expansion plans and repress local power usage. When Eskom deemed to cut down its electricity export to support its power demand at home, the electricity supply in Botswana, Namibia, Mozambique, Lesotho, and Swaziland, countries that import power from South Africa, was severely affected. The foregoing, however, was not unexpected. In 1998, the government of South Africa apparently acknowledged the necessity of investing in electricity infrastructure amidst the threat of a power crisis looming large. It deemed, therefore, to privatise Eskom to inject new capital, thus encouraging a ramp up on its efficiency. The finalisation of any agreement, however, was reported to have taken longer than expected, and by 2008, the utility found itself unable to support the then-existing power demand. Other governments in the region were said to have admitted to underestimating the trajectory of power requirements. In 2008, Botswana Power Corporation said that the energy forecast was skewed by the proliferation of new mines, which meant a steep spike in power demand, not only in Botswana, but also in other countries, such as Zambia. At present, solutions are underway – but they, naturally, will not come cheap. Economic reports indicated that, at the prevailing growth rate of the demand from industries and residents, the region would have to double its power generating capacity by 2025, at an approximate cost of $171-billion in South Africa alone. Of that amount, $45-billion would supposedly have been needed before 2013. In order to sustain this projection, the governments have identified potential sources of funds, such as approved power rate hikes and foreign investment. Yet, power hikes could stir alarm and protest from the citizens and trade unions, and could prompt industrial entities, like mining corporations, to cut down on operations, putting jobs and production at risk. Foreign investment agreements, on the other hand, could take time to materialise, and the planning, designing, installation and commissioning of alternative power generation projects may entail years, if not decades. Unstable electricity production and regular power interruptions bring about a multitude of negative impacts to any country’s economy, business and citizens. In today’s world, power has become a fundamental element for any economy to function, as every sector of the modern society, be it domestic, commercial or industrial, is heavily dependent on electricity. Nowadays, a power interruption affecting critical facilities, such as hospitals, airports, telecommunications towers, data centers, mining facilities and oil & gas installations, has the potential to put an entire country, region or city to a standstill, and in light of globalisation, the consequences could transcend national or regional borders. Hiring interim power generation plants to bridge the gap between the demand and the supply of electricity yields many advantages, particularly when there is a foreseeable delay in the fruition of permanent power generation facilities or when the temporary power is immediately needed. It was clear in the above-mentioned examples that countries in sub-Saharan Africa are looking to mitigate the observed deficiency in power supply by upgrading existing facilities, soliciting foreign investment to build new power plants and harnessing the potential of alternative sources of energy, including geothermal, solar, hydro and nuclear. While the aforementioned initiatives have recognised and acknowledged merits and potential, they may require further research, planning, designing and legislation, and additional physical facilities to be operational; and this takes time. When time is of essence, rental power companies, like Altaaqa Global CAT Rental Power, are capable of providing solutions as needed, when needed. Utility companies in the region, can hire temporary power plants in times when demand outpaces the supply, when the electrical grid is unstable or when power distribution networks are unavailable, like in the rural areas. This will allow them to bridge the supply deficit without waiting for another day. Hiring power generators can prove to be a viable solution to power supply inefficiency, bridging the power gap while the permanent power solution is still in progress. The world welcomes the positive outlook of Africa’s economy. The continent that was once regarded as a tailender in terms of development, is now making an aggressive move towards economic stability and viability. While achieving a buoyant economic climate is a feat in itself, the real challenge lies in staying afloat. To sustain the economic optimism that Africa is now enjoying, it is imperative that the governments, particularly in sub-Saharan Africa, address the critical issue of chronic power shortage, which could hamper the development of various industries in the countries. The effort that the region’s governments are applying to address this predicament is commendable, but there exist other entities which can help them to further alleviate the situation. Rented power addresses the issues of urgency, cost-efficiency, reliability, energy-efficiency and environmental safety. In recognition of the indispensable role of electricity in today’s modern society, it is advisable that utility companies provide for a contingent power solution in cases of power interruption that may lead to operational delays and, ultimately, negative social, economic and financial consequences. Dubai-based Altaaqa Global CAT Rental Power, a global provider of temporary power solutions, has recently opened a new branch in Johannesburg that will cater to several countries in Southern Africa, including the Republic of South Africa, Angola, Botswana, Mozambique, Madagascar, Malawi, Namibia, Zambia and Zimbabwe. One of the flagship innovations that Altaaqa Global will offer, he added, was the flexible operational mode that can switch from island to grid mode in just seconds. Furthermore, Altaaqa Global’s energy rental dynamic package allows its power plants to hook directly to the grid without the need for a substation. 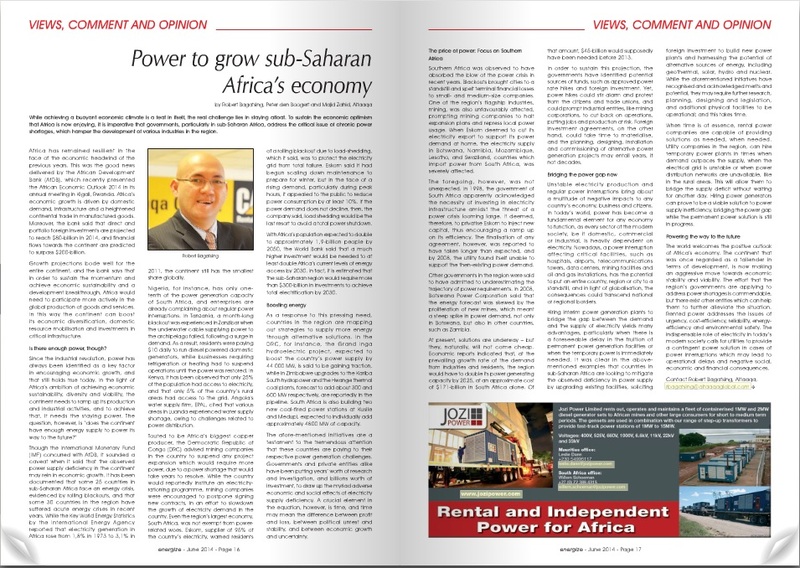 The global outlook for the rental power industry has been encouraging, and Steven Meyrick, Board Representative of Altaaqa Global, sees merit in capitalizing on it through strategic market and geographic expansion. “With this recent feat, we believe that we are on our way to fulfilling, even exceeding, the highly ambitious objectives we set at the launch of our company in 2012.” Meyrick added that Altaaqa Global would continue to pursue multi-megawatt independent power projects (IPP) in various industries, in addition to heavily investing in human resources, process and business optimization, and product expansion. The economy of Southern Africa is largely driven by the precious stone, mineral and coal mining industry. The Republic of South Africa, a leading economy in the Southern African region, is ranked as an upper-middle income economy by the World Bank, and is touted to be the largest African economy ahead of Nigeria. 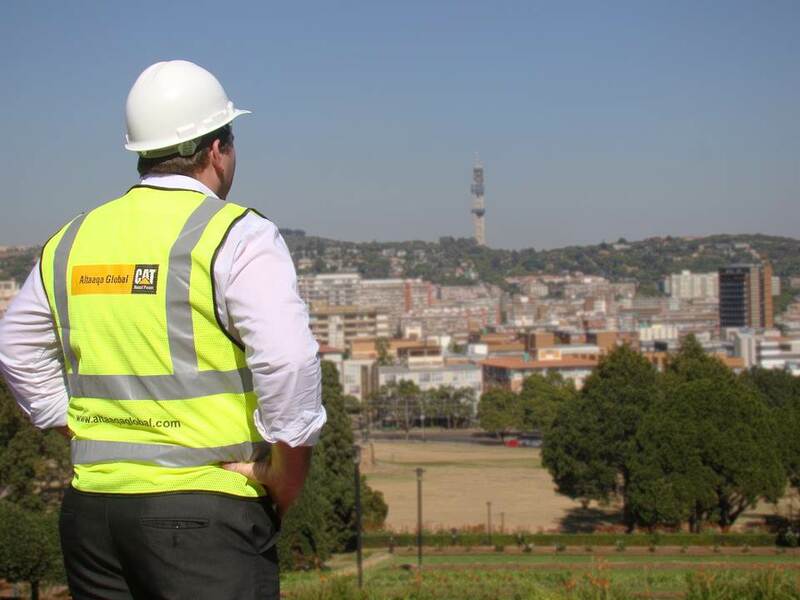 Though still reeling from the effects of its recent economic setbacks, the African Economic Outlook expects South Africa’s economy to moderately accelerate in 2014. Angola’s economy, after experiencing slow growth due to the recent oil and financial crises, is also predicted to be on the rebound, expected to grow by 7.8% in 2014. Furthermore, Mozambique’s economy is forecast to maintain its upward trend, predicted to grow by 8% in 2014. Agriculture, manufacturing, oil and gas, in addition to mineral and coal mining, significantly contribute to the countries’ GDP, as well as to their employment rates.